United Nations is a proud supporter of the LGBTQ+ community. Equality for all. Love is Love. This is the official <UN> Badge for all Asian Members from United Nation. This badge is for Silver Mods. Silver Mods are responsible for reporting fake sales, fake bids and also maintain the room. They also are able to sell Bronze VIP. This badge costs 2gb. Congratulations! You have been recognised for your great efforts and support within our community. You will be entered into a draw at the end of the Month to win either coins or bonus rank points! UN - Department of Radio is a Special Unit within UN, We live in a world were somtimes Music can describe our every thought even when we have nothing to say. Madali maging tao, Mahirap magpakatao. For those who love building their achievement badges! Click Forums for complete guides on every achievement! hey, fanbase towards Paulo (Lifeless?) This group is a group that is created for a reason of fans to love the kind of music i play & create. Free Housing :) Please enjoy and rate the room up!!! Happy Habboing! 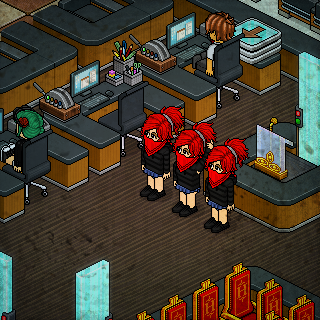 Obey the habbo way!!! Join this group if you love Tumblr! Owner: bobba & Malikka-Safety / I only have 2 account, Don't trade other people than me for safety. Everyone can join! A place to hangout and have fun. Watch our amazing movies! Stay for a night, and enjoy our most satisfying service! your welcome to come in! Taken in this room on 7 November 2018 and received 0 likes. Taken in this room on 5 November 2018 and received 1 likes.